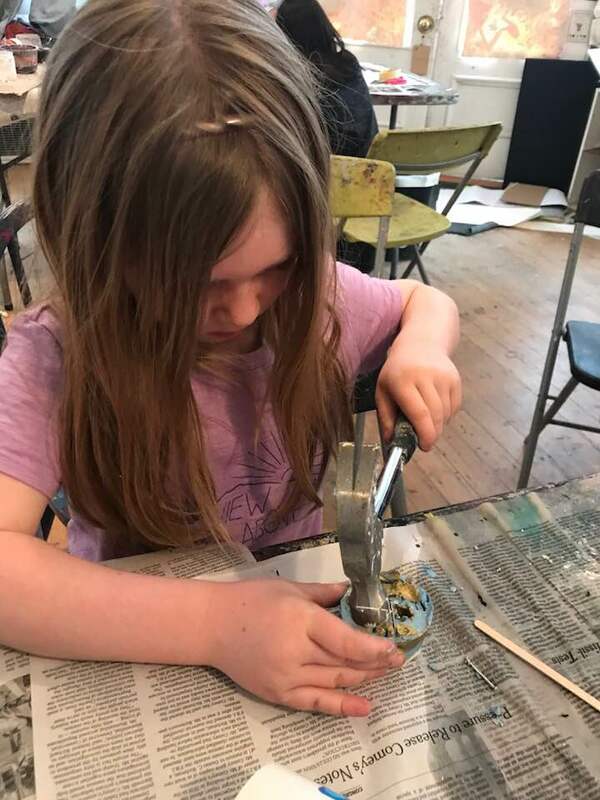 For those who are out of school in early June we've added an early summer art week the week of June 18th-22nd. We'll meet 9-2 with an option to drop off at 8:30 and a few spaces available to stay until 6. Sign on by the day or full week. 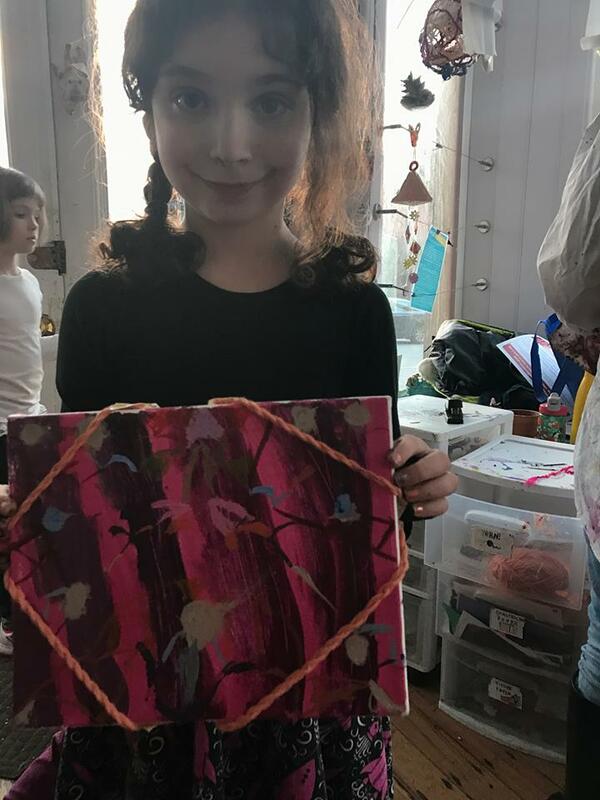 We will be keeping sketchbooks, painting on canvas, printmaking, building and of course making unexpected magical creations! With questions and to sign on please email artwithamystudio@gmail.com. Week of July 4th! Join us for a fun week of art field trips! This year we will be touring Boston neighborhoods and exploring the rich art scene Boston has to offer! Our explorations will include the art walk on the Greenway, Harvard's Fogg art museum, the ICA and the MIT art walk. This week will include keeping a sketchbook, picnics and cafes. Also, check this out- art field trips are not only fun they may also improve your child's test scores! This year we are open all summer starting as soon as Brookline schools let out. Many weeks are starting to fill with just a few spaces remaining the last couple of weeks in August. We have two full weeks of fiber arts with Saori Worcester this year! 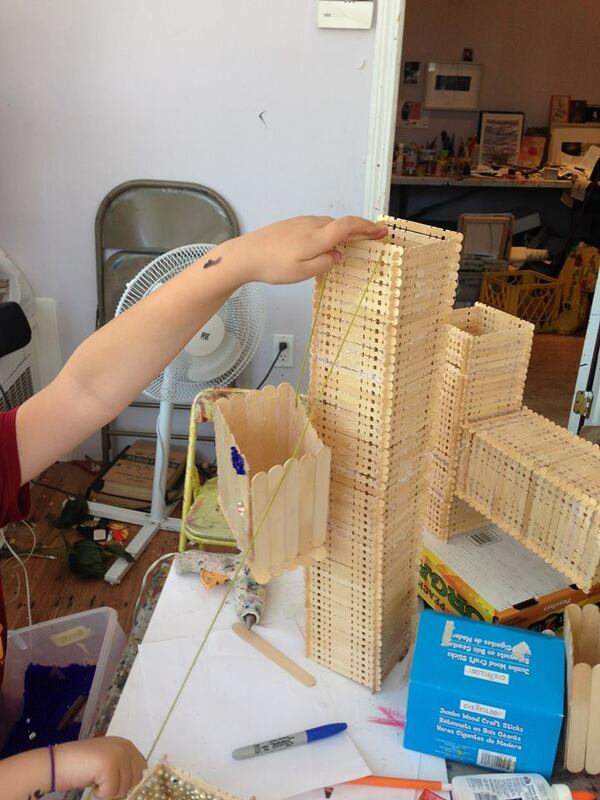 Large looms, sewing machines and a whole bunch of fun! 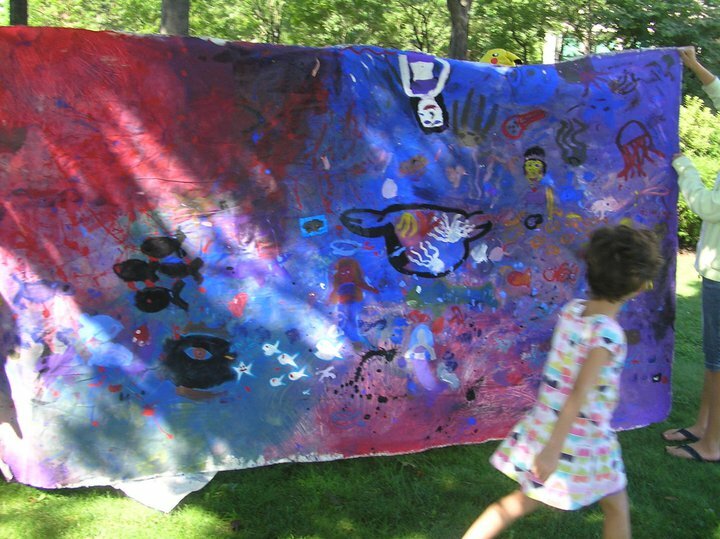 Introducing art field trips the week of July 4th. MIT sculpture tour, Greenway art walk and more are planned. 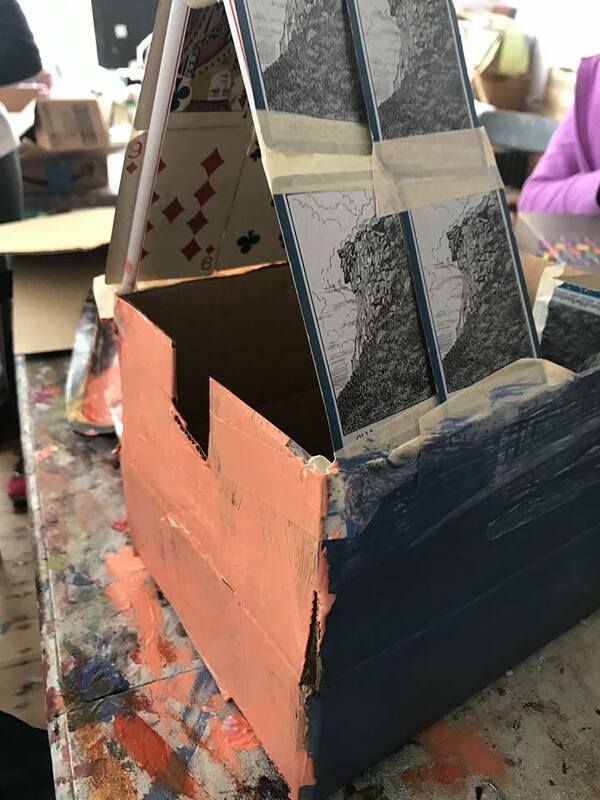 Lots of weeks of painting, drawing and building AND really GREAT afternoon workshops with some fantastic visiting artists including printmaking, jewelry making and sewing. This year we have early drop off at 8:30. 9-2 and 2-5 options. Feel free to email with any questions and to sign on. As always payment reserves your space. We are still offering early bird discount until June 1st. The 2-5 workshops offer special projects with guest instructors! The Saori weaving weeks are 9-2 with no afternoon programming. These are $500 per week. I'm super happy to have one of my drawings in the show "Personal Geographies" at Chandler Gallery/Maud Morgan Arts 20 Sacramento Street, Cambridge MA. This piece is from Day 13 of my ongoing 2018 Drawing-a-Day project. Hoping you can stop by and check it out. Gallery hours are 10-5:30 and this exhibit is is up until April 20th. If you'd like to meet me at the gallery let me know. I'll also be showing more from this series during Brookline Open Studios on April 28th and 29th. Hours 1-5 in the AWA studio on 45 Harvard Street. 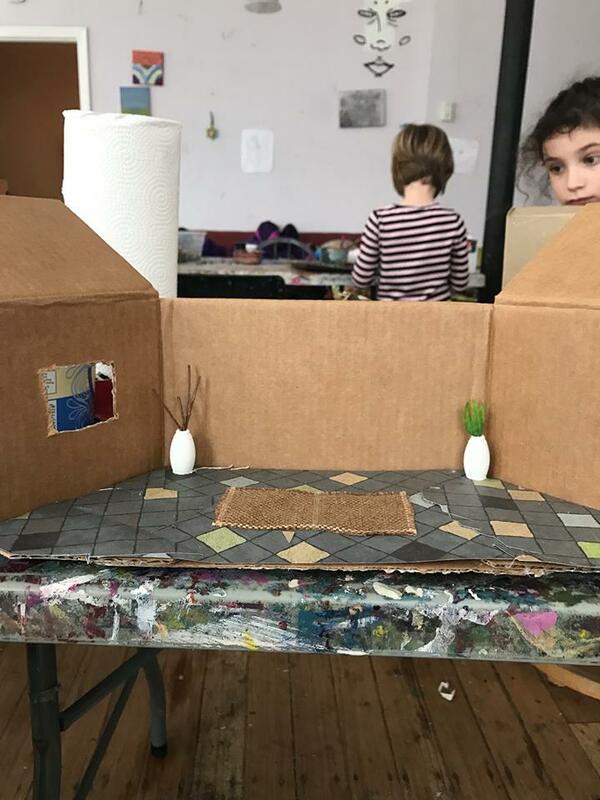 Lots happening in the studio during the February vacation week! If you'd like to make art Wednesday rather than the planned field trip please also email us. Saturday morning class for 4's and 5's! Saturday morning class for 4's and 5's! First class Feb 3rd meeting 10:00- 11:30. Lots of painting, building, sketch booking, printing and loads of fun. This class is limited to eight students. Please email artwithamystudio@gmail.com to sign on. It's $225 for eight classes. Thank you to the Art with Amy community near and far! During the Fall we had a spontaneous month long art sale to benefit our fellow Americans in Puerto Rico. I was blown away by so much generosity both near and far! We raised $6,300 through art sales! Thank you to all the artists who contributed their art! Thank you to all of you who bought art! Most of the funds raised went to Chef Jose Andreas' amazing organization World Central Kitchen. We were also lucky to meet people traveling to Puerto Rico who hand delivered solar radios and first aid kits we purchased. Jose Ortiz- Luaces delivered the solar radios. Bianca Bonilla travelled home to Puerto Rico bringing the kits with her. Here are some pictures from her visit. New Year's resolution: Make more art! 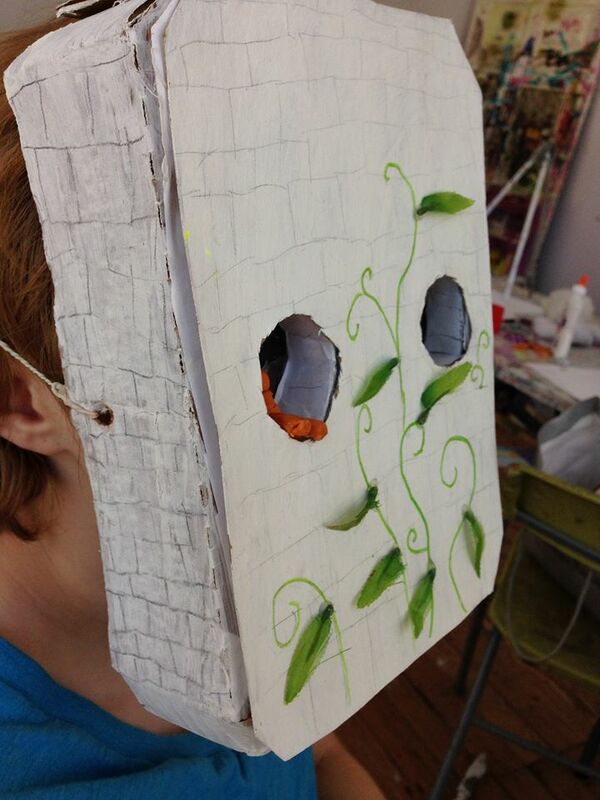 Every Thursday night 8-9:30 a small group of us meet in the studio and make art. Let us know if you'd like to join us in the new year! $30 per session including all supples. Happy New Year! We are super happy to announce our partnership with the A.R.T. in Cambridge! 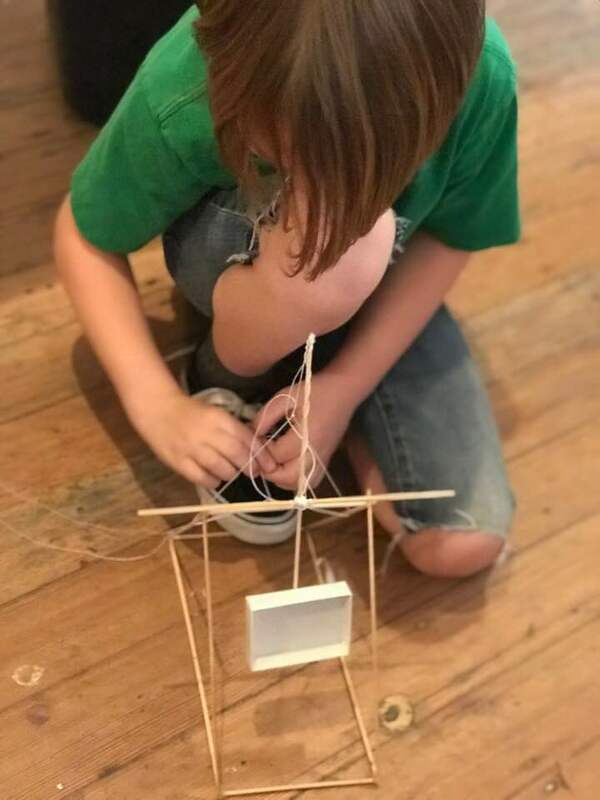 We've planned a super FUN two-day adventure that includes going to see Charlotte's Web and making art. Our two-day art extravaganza will include TWO 9-5 days on Tuesday, December 26th and Wednesday, December 27th. 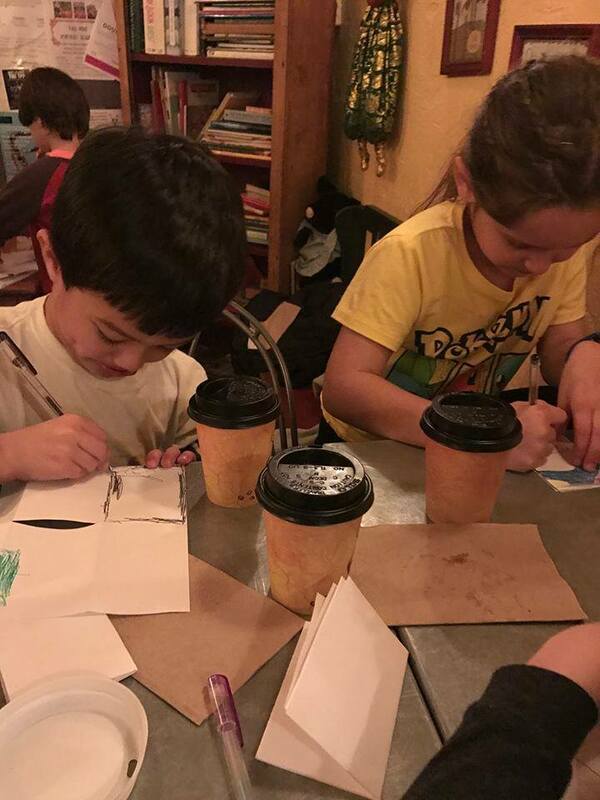 Our Harvard Square experience will include: going to the A.R.T., out for pizza and hot chocolate, sketch booking in a cafe AND back at the studio - LOTS of art - painting, mask making, print making, sewing projects and more. All inspired by Charlotte's Web! The cost for this program is $315 including tickets to Charlotte's Web, pizza, hot chocolate and all art supplies. This program is for school age children. As always payment reserves your spot. Email to join the fun! Half day workshops! 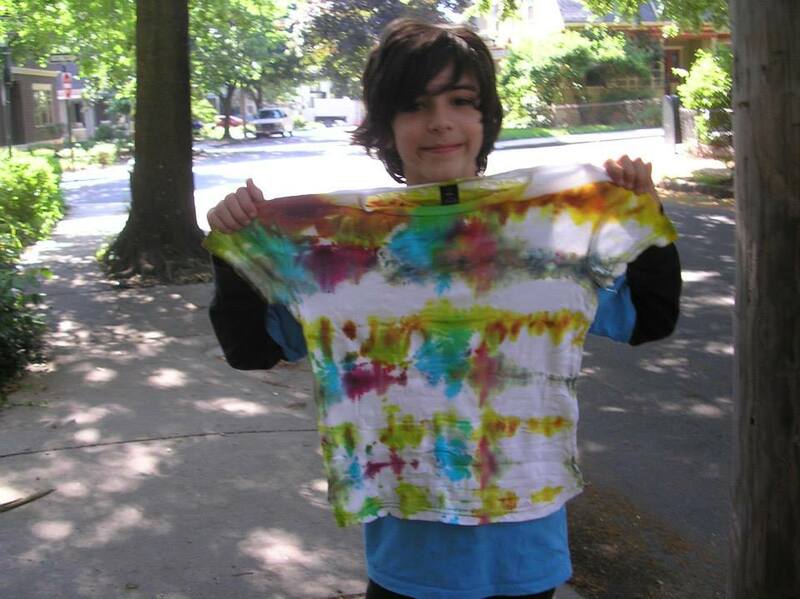 Tuesday, December 5th Make Gel Prints with Martha! Wednesday, December 13th Create Upcycle Jewelry with Elizabeth! 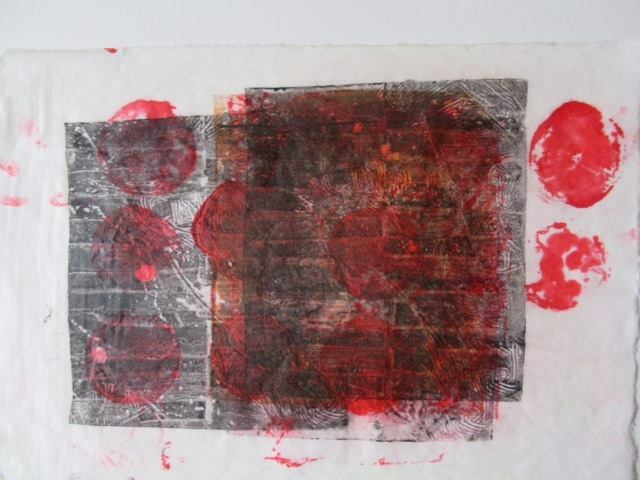 Martha Friedman will be in the studio teaching the fun technique of gel prints! If time allows students will bind prints into a book. Elizabeth Fernandes will in the studio teaching upcycling jewelry making. Weaving on floor looms! Sunday December 3rd 10-12! We are super excited to have Mihoko Wakabayashi from SAORI Worcester in the studio with floor looms tomorrow morning 10-12. Let me know if you'd like to join the fiber fun! Cost: $85. Experienced and novices welcome! Adults and children! EVERYONE will leave with a beautiful hand woven scarf! Lots happening in the studio the next few weeks! Succulents!! Theses are for the new Art with Amy project boxes. The terrarium kit will be available to purchase in the studio starting this Thursday November 29th 6-8 as part of Brookline First Light! We'll also be making zines AND there will be art for sale to benefit Puerto Rico. Hope to see you!